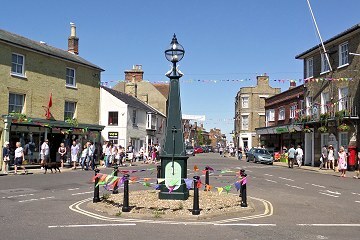 Southwold is a charming north Suffolk seaside town on the Suffolk Heritage Coast. Almost an island, being bounded by the North Sea to the East, by the River Blyth and Southwold harbour to the South–West and by Buss Creek to the North, there is just the one road in to and out of Southwold, approached through neighbouring Reydon. Southwold seafront with the pier in distance. The town offers much of interest, but it is the sea and Southwold’s links with it that make this a wonderful destination at any time of the year. Come and sample the Southwold sea air! All the attractions of the working lighthouse, beach huts, award-winning pier, busy harbour, cliff top cannon and of course the beach, combine to make Southwold a quintessentially English resort town. 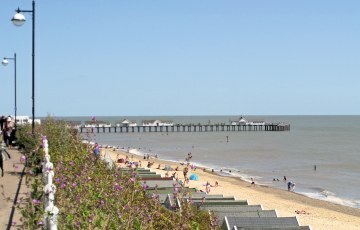 Take a look at Southwold from a different viewpoint and learn a little about it from the photo captions on our Panorama feature. Accommodation in Southwold features self-catering cottages and houses, bed and breakfast establishments, guest houses and pub accommodation as well as the camping and caravan site near the harbour. Maybe stay close to the town, abandon the car and relax by just walking the coast and footpaths. For details of local events visit our what’s–on calendar. Venture across the River Blyth by foot ferry to Walberswick, perhaps crossing back by the footbridge, in so doing exploring the trackbed of the old Southwold Railway.